The beauty is that inexpensive promotional products such as pens and coasters, can be just as effective as costlier items like USB sticks and leather goods. Promotional products are a proven strategy. A 2013 study by the BPMA found that 94 per cent of people remember the advertiser that gave them a promo item when they’ve had it for 6 months. What are the cheapest products? If you’re on a tight budget, here are 5 of the most popular inexpensive promotional products available. Pens are one of the most popular branded merchandise items. They’re effective because they’re used frequently, for long periods of time. A pen will give you good exposure because it lives on the office desk, and is carried on the recipient’s person. Plus, you’ll get lots of choice, with hundreds of styles and colours available to suit every business. Even a basic card coaster can generate a good return because it’s useful to the recipient and gets a prime desktop position in the office. The only problem is it may be seen as disposable. Choose something more durable like Vinyl coaster (24p) or Brite-mat coaster (28p) so it can be wiped clean and kept forever. Everyone has keys. For the house, office, car, and even the garden shed - a keyring will always come in handy. This inexpensive promotional product is available in a multitude of designs, styles and colours, to complement your brand - making it a successful marketing tool. 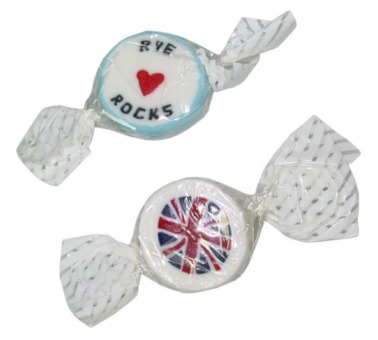 Give away individually wrapped rock sweets with your name or logo running through the centre - that cost you just 5p each. But, there’s an obvious problem with confectionary, once it’s gone so is your message. 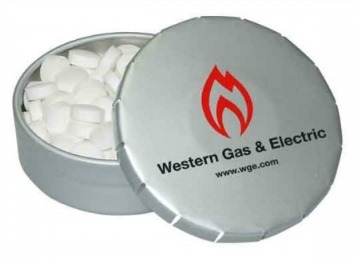 Our credit card shaped mint container with sugar free mints from 25p will give you much more exposure. This promotional product may be inexpensive but your badges will only work for you if they’re worn. If you can get creative with your marketing, you can be highly successful. For example, Reebok’s ‘I am what I am,’ or Adidas ‘Impossible is Nothing’ – are both great badge slogans. All prices quoted above include basic product customisation - normally one-colour printing. They are subject to minimum order quantities, excluding design, VAT and delivery. Once you’ve decided on a product, you get to the hard part - comparing quotes, finding a supplier and placing your order. Here’s what you need to know about pricing and some tips to help you get the best possible deal when buying your inexpensive promotional products. It’s better to estimate how many items you require before you start looking. To do this you’ll need to consider how and where they’ll be distributed and do some number-crunching. This will allow you to rule out certain suppliers immediately. For example a large wholesaler may require very high volume orders that aren’t suitable for small businesses. It’s hard to compare costs in the promotional products industry. Most websites quote ‘from’ prices designed to give you an idea of cost. Unfortunately it’s hard to determine whether you’re comparing like for like. The only way to get a true estimate is to request formal quotes from suppliers, then you can compare totals. Don’t fall into the trap of purchasing items because they’re perceived as higher value in spite of quality. For example, choosing a good quality promo pen is far more desirable than say a cheap, tacky alarm clock. Something simple, classic and long-lasting will achieve much better results. Even for inexpensive promotional products, this should be your primary concern, don't forget it's your reputation and brand on the line! Most suppliers will charge a flat set-up or design fee so you’ll need to work this into your costs. Basic one colour printing (or possibly digital full colour print depending on product) is normally included in the item price. You’ll usually incur additional charges for extra colours, printing in multiple positions, or engraving. To save money, go for a basic one-colour print - name, phone number, web address. If you have a simple logo design you can include this too.